Healthy Now and Later: Old age is no place for sissies. Here is a list of the 5 most common problems I hear about as a nurse from those 55 and better, and how you can prevent, overcome, or manage them. "Senior moments" can happen to anyone. As one women I know in her sixties said, "People lose their keys when they are my age and they think it's their age. Even though, plenty of teenagers lose their keys, and when they do, they just say they lost their keys." Until recently, scientist thought this was due to information overload, however now they have started to truly pull apart the differences between the start of dementia verses just regular, well, forgetfulness. The adult brain actually may function better in some ways, because it knows how to ignore what it deems as unimportant. Did you catch that? What IT deems as unimportant. So when you're on your way to the kitchen and--you get there with a blank stare completely forgetting what you went there for. Don't fret. Your brain just ranked "it" lower on the importance scale. This particularly applies to the 50 and 60-something's. The best thing to do to keep your neurons in gear is the following: Stop smoking if you do, exercise if you don't already, and keep your mind active with things including playing puzzles like crosswords or sudoku, learning new things, and reading. 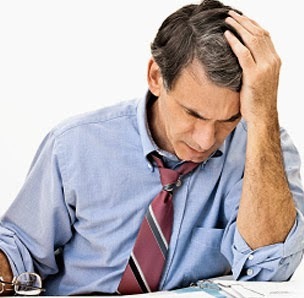 The good news is that the majority of older adults aren't depressed. The bad news is, it's on the rise. According to the Center for Disease Control and Prevention (CDC), "major depression in older people living in the community range from less than 1% to about 5% but rise to 13.5% in those who require home healthcare and to 11.5% in older hospital patients." Depression can especially come to those who have multiple multiple illnesses (like heart disease, diabetes, kidney failure, ect.) or those who have lost multiple loved ones. There are means of getting help if you see yourself or someone else going in this direction. There are medications available (prescription and non-prescription). Studies have also shows that simply increasing physical activity, increasing the amount of time spent doing enjoyable activities, and spending time with others (whether volunteering or simply spending more time with friends/family) may also improve mood. Read more from the CDC by clicking here. According to the World Health Organization (WHO), approximately 65 % of all people who are visually impaired are aged 50 and up. The biggest culprit: Macular degeneration. Macular degeneration results in a loss of vision in the center of the visual field (the macular) due to damage to the light-sensitive tissue lining the inner surface of the eye (the retina). As a result, the center of your vision is lost making it difficult to read or recognize faces. The peripheral vision remains however. 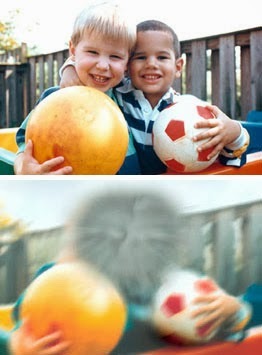 (See image to the right; top image is normal vision, bottom image is what would be seen with macular degeneration.) To help prevent macular degeneration, wear sunglasses when in direct sunlight, manage high blood pressure, and do not smoke. First, the bad news. With age, joints do become stiffer and less flexible. The fluid-filled sacs that once served as soft cushions between cartilage or bone may have less fluid in them or non at all. This causes cartilage to rub together and erode. Minerals may deposit in and around some joints ( referred to as calcification). This is especially common in the joints of the shoulders. Hip and knee joints may begin to lose joint cartilage due to degenerative changes. However some joints, such as the ankle, typically change very little with aging. The good news is that exercise will actually help maintain bone mass. Also, a diet rich in calcium and vitamin D (which helps absorb calcium) will also do you good. Likewise, there are prescription and non-prescription means of preventing bone loss and maintaining joint health. Hearing loss can be difficult for the individual affected, as well as their loved ones. Doctors do not know why age-related hearing loss happens, but it seems to run in families. Another reason for hearing loss may be exposure to too much loud noise. Less commonly it can occur due to a virus or bacteria, heart conditions or stroke, head injuries, tumors, and certain medicines. Here is a link to an infographic that outline the degrees of sound that effect our ears: Via facebook or Blog. The best thing to do if you start to notice hearing loss is to speak with your doctor about what is causing the loss. From there, they will help you find the best route of management.